Charlie, owner of Brontosaurus Vegan Lifestyle Store set up her store back in January 2017. 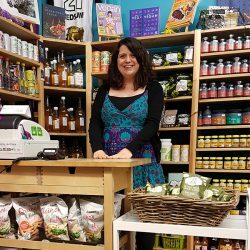 Since opening the store she has seen her lifelong dream develop into a successful independent business offering the community of Swansea a vegan only store. Charlie has worked in Health Food shops pretty much all her working life, in fact, she started working at the ripe old age of 11 when she worked with her Grandad at his health food store in Mumbles. As Charlie’s working life progressed she worked in a number of health food stores with a lifelong dream of following in her Grandfather’s footsteps opening her own store. As a lifelong vegetarian and more recently a vegan (4 years), Charlie spotted a gap in the market for a vegan only specialist store as buying vegan food was a difficult task. With the help of Charlie’s friends, family and the vegan community the lifelong dream to open her own store was achieved back in January 2017 when Brontosaurus was opened in Swansea Market. It wasn’t a walk in park opening her own store, Charlie started off with second-hand equipment and purchased the bare minimum shelves to stock just a few of each of the products that had been carefully sourced to be featured at the store. Within the first 6 month’s Charlie found herself continuously researching new vegan products and expanding the product range to include vitamins, clothing and cleaning products. The shelves of Brontosaurus are now packed with all sorts of products – all vegan of course! Brontosaurus goes from strength to strength as earlier this year, a 100% Vegan Market (at Swansea Market) was organised by Charlie and was a tremendous success. So much so that Charlie intends to run them bi-monthly starting from August. When we asked Charlie about being based in Swansea City Centre she commented on how it was a great place to start, particularly with Swansea Market. It really has a community feel to it and the addition of a vegan store went hand in hand with the range of already great food stalls giving the UKS biggest indoor market another angle! Swansea Market has a great community feel to it with plenty of support from fellow traders, security and management too. All in all a great place to start up a business. What does the future hold for Brontosaurus? Charlie has dreams of opening her own cafe with a community centre feel to it but is adamant Brontosaurus will remain in the city centre! If you’re a vegan then a trip to Brontosaurus in Swansea Market is a must! If you’re shopping in July, make sure you collect your Independent Retailer Loyalty Card and get a stamp every time you shop for a chance of winning £500.